Part of overall well-being is feeling confident when you smile at others. We believe that every person should feel free to smile whenever the urge strikes. This expression makes a good impression and can sometimes make someone's day. Therefore, we find the appearance of your smile is as important as the maintenance of your oral health, and design plans that can accomplish your oral health as well as your aesthetic goals. 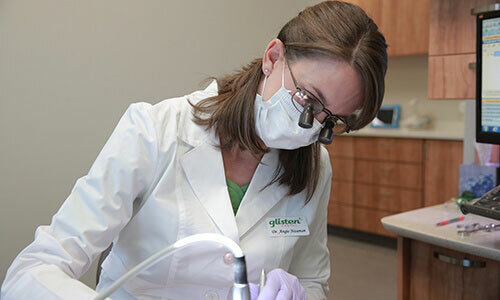 When you’re ready to get started, call the Glisten Dental & Sleep Apnea Care team to schedule your consultation appointment with our skilled cosmetic dentist in Tulsa. Because our teeth are porous, substances that lead to stains easily find their way into deep layers of enamel. Once settled, teeth begin to dull and discolor. We all experience discoloration at one point or another because it is virtually impossible to avoid all factors that lead to staining. At Glisten Dental, we provide two different approaches to teeth whitening so that all of our patients may find their optimal form of smile enhancement. For those who want a whiter smile without the wait, we administer in-office teeth whitening using the KöR Whitening Deep Bleaching™ System. At-home whitening trays are also available, to be worn each day for about two weeks. A bright white smile is indicative of health and vitality. More than that, today we are in the business of making snap judgements. We have less than a minute in which to make our first impression. Depending on the circumstances, such as during a job interview, that first impression is all-important. To help our patients attain the level of smile brightness they feel most comfortable with, Dr. Angie offers professional teeth whitening options. Once you achieve your desired smile brightness, it’s easier to maintain this level of brilliance, so you’ll continue to look your best. A straighter smile used to mean spending 18 to 36 months (or longer) with metal brackets and wires attached to your teeth. Today, you can achieve the same flawless smile alignment using the Invisalign clear alignment tray orthodontic process. Invisalign trays place pressure on teeth to shift the smile into alignment just like metal brackets and wires, but you won’t have to worry about the hassle and less-than-cosmetic appearance of metal brackets and wires. In just 8 to 18 months on average, these clear alignment trays will move your teeth into their ideal alignment, leaving you with a beautiful smile in less time with minimal hassle. When teeth have been chipped, fractured, significantly discolored, are crooked, or contain gaps, porcelain veneers may be the most suitable form of cosmetic treatment. A single veneer can correct a chipped or cracked tooth, or several veneers may be custom-fabricated to create a whole new smile. In addition to traditional porcelain veneers, Dr. Angie also uses Lumineers to enhance a smile. When a tooth requires a filling, there is no need to use amalgam metals when composite material creates a seamless transition and the strong foundation needed for biting and chewing. Using precise techniques, tooth-colored composite material is bonded to a tooth after all decay has been removed, restoring structure without leaving that telltale dark spot in the smile. Today, we use that same tooth-colored composite filling materials to correct and conceal cosmetic flaws like chips, cracks, stains, and gaps in the smile. This cosmetic service is often referred to as cosmetic or dental bonding. In just one trip to our dental office, we can correct a number of flaws, so you’ll leave with the picture-perfect smile you deserve.